Today's post is going to be an another nutritious evening snacks to enjoy thoroughly with your favourite sauce. Served even as appetizers, this protein rich patties aka cutlets makes an excellent crowd pleaser.This recipe is very simple and definitely a wholesome patties to give a try. Black-eyed peas have many vital nutrients such as Vitamin B, Vitamin E, iron and potassium. Half a cup of cooked black-eyed peas have only 80 calories obviously if you want to loss some weight dont hesitate a second to have your dose of this beans for your snacks or in your meal.Not to forget that one of the main health benefit of these beans is their high fiber content which helps a lot to regulate our digestive system. Usually potato is used for making cutlets/tikkis, but my today's post is completely different from the usual one. I used leftover cooked rice instead of potato and this works prefect for making some nutritious cutlets. 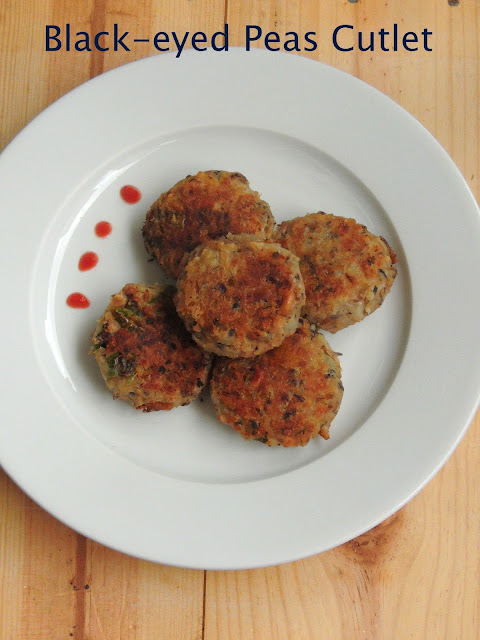 This cutlets are my last post for this week's blogging marathon, you might have noticed that am running Mega marathon for this whole month of September with 5 ingredients for 5 weeks as theme under the title Cooking Carnival. After dishing out three different dishes with dry green peas, i have been posting some delicious dishes with black-eyed peas as this beans is a star ingredient for this week. Hope you all enjoyed the variety of foods i have blogged during this week. Stay tuned for know about my next week's posts with an another incredible dry bean which am gonna showcase for a week. Combine the cooked black-eyed peas, cooked rice, garam masala powder, fennel seed powder in a large bowl. Add this cooked veggies along with the already prepared black-eyed peas-rice mixture. Make a white paste with cornflour and enough water, dip the flatten cutlets. Enjoy with ketchup for evening snacks. Never considered rice as a binder for cutlets. Lobia cutlets have a nice crunchy outer layer. 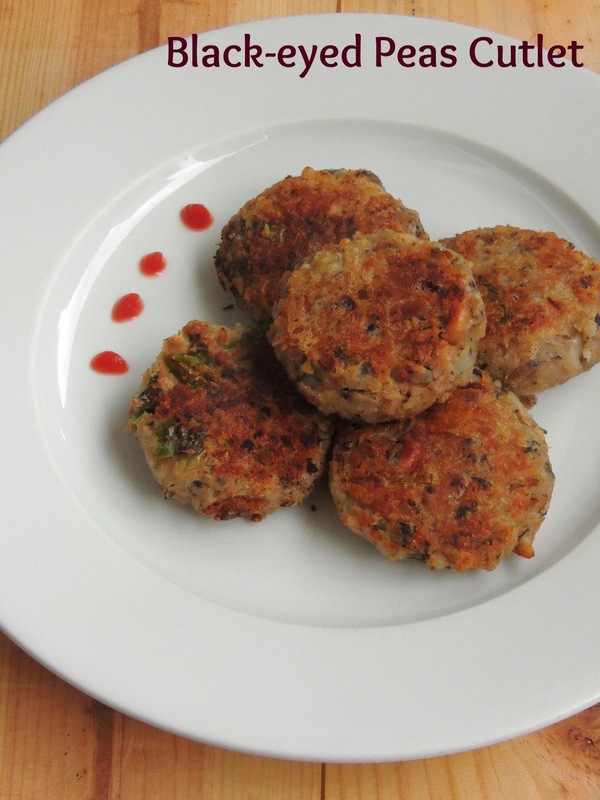 These cutlets will make a great evening snack. Looks so delicious..
Never added rice for binding sounds like an interesting idea.BTW tikka looks absolutely delicious.. Even I like to add rice to lots of dishes, the Tikkis have a new combination and I am drooling over them. Rice and black eyed peas tikki looks tasty. Tikki with rice is a great idea.. amazing.. Wonderful recipe with rice. Great idea to use the leftover rice. Wow taste bhi aur health bhi. Love the cutlets. These rice and black eyed peas cutlets ar fabulous!! What a fantastic way to use rice and making this cutlet! Looks very inviting. 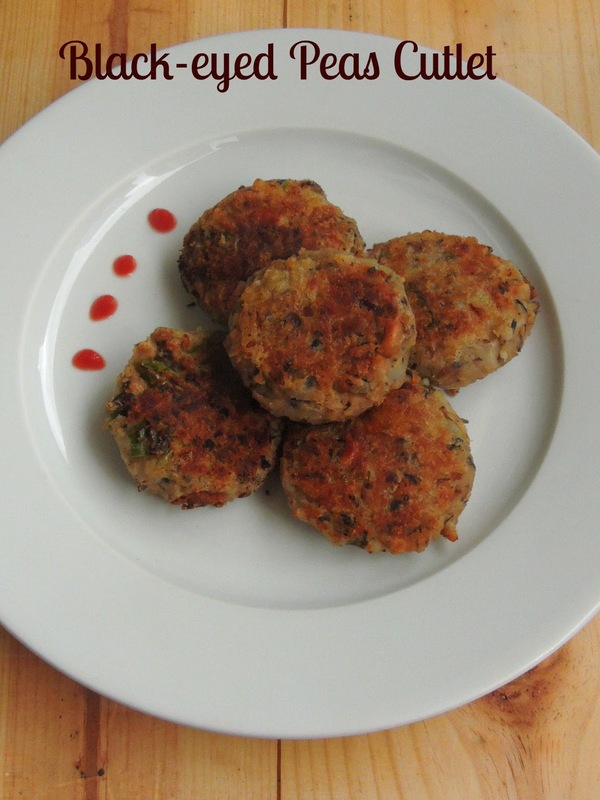 Wow priya, crispy cutlets, loved the way you have used rice along with the beans here. Quickie after school snacks for kids. What an innovative idea to use cooked rice instead of potato to make cutlets. They look so crispy on the outside. I absolutely love recipes using cooked rice. This one is perfect to get my daughter gulping down her meal quickly!